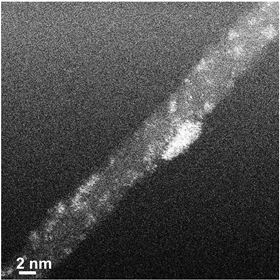 Tunneling electron microscope image of a carbon nanotube decorated with platinum clusters (bright color). As a very expensive metal, platinum is one of the bottlenecks hindering the growth of renewable energy. Platinum is used as the catalyst in electrolysers that store electric energy as chemical compounds, and it also plays an important role in fuel cells, catalytic converters and many chemical processes used by industry. Now, however, a group of researchers at Aalto University in Finland, led by Tanja Kallio and Kari Laasonen, has developed a novel electrocatalyst that uses just one hundredth of the amount of platinum generally used in commercial electrocatalysts. Despite this, the new material, which takes advantage of the special characteristics of carbon nanotubes, has a similar activity to that of commercial electrocatalysts. The researchers report their results in a paper in ACS Catalysis. “When platinum is electrodeposited on the surface of carbon nanotubes, it forms particles consisting of a couple of atoms. On other materials, such as graphene, platinum forms larger nanoparticles,” Kallio explains. Electrolysers store energy in the form of hydrogen bonds. In practice, they are used to store the energy produced by fluctuating energy sources, such as wind energy, helping to balance the difference between demand and supply. Since the electrocatalyst accounts for approximately one third of the price of the electrolyser, reducing the amount of platinum needed would make the process significantly less expensive. Computer simulations have revealed how a new electrocatalyst comprising nickel nano-islands on platinum can be both active and stable.